Birterbuy Bay is also of considerable extent; the beautiful little river of Ballinahinch falls into the bay at its upper extremity. This river has its rise in BALLINAHINCH LAKE, at about four miles distance from the sea-shore. On the banks of this lovely and secluded sheet of water stands Ballinahinch House, formerly the residence of Thomas Martin, Esq., the proprietor of the greater part of this wild district. 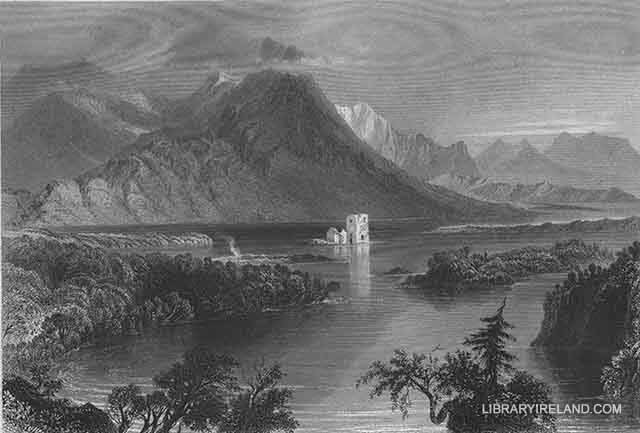 The mansion is a plain building, but the situation it occupies is surpassingly beautiful, overlooking the lake that sleeps in calm repose at the foot of the impending sides of Lettery and Bengower, which here form the front of the magnificent group of conical mountains, called the Twelve Pins of Binabola. From the bridge which crosses the river near the house, a fine view may be obtained of the lake and the ruins of the old castle, standing on a small island in the lake, and forming a picturesque object in the landscape. On Roundstone Bay stands the modern village of Roundstone, built by the late Alexander Nimmo, the celebrated engineer, whose scientific knowledge led him to the conviction that the best mode of raising the commercial prosperity of Ireland, was by means of her noble harbours on the western coast. Impressed with this opinion, he expended large sums of money in building a handsome pier and erecting houses at Roundstone; but his exertions were received with apathy or jealousy by those who should have aided his efforts, and he died in the prime of life, leaving his noble designs unaccomplished; but not until he had done enough to prove the soundness of his theory, and the correctness of his expanded views. The bay of Roundstone is backed by the lofty mountain of Urrisbeg, upon whose steep acclivities grow many rare and beautiful plants. Mr. Inglis enumerates several, and amongst them the Mediterranean heath, which I believe is not found elsewhere in Ireland. The same writer, speaking of the view from the summit of Urrisbeg, describes it as "more singular than beautiful." "Here," says he, "Connemara is perceived to be truly that which its name denotes, 'Bays of the Sea.' The whole western coast of Connemara is laid open with its innumerable bays and inlets: but the most striking and singular part of the view is that to the north, over the districts called Urrisbeg and Urrismore. These are wide, level districts, spotted by an unaccountable number of lakes, and mostly entirely uncultivated and uninhabited. I endeavoured from my position to reckon the number of lakes, and succeeded in counting upwards of one hundred and sixty. Shoulders of the mountain, however, shut out from the view some of the nearer part of the plain, and other parts were too distant to allow any very accurate observation; so that I have no doubt there may be three hundred lakes, large and small, in this wild and very singular district. Several of the lakes have islands upon them, and by the aid of a good telescope which I carried with me, I perceived that many of these islands were wooded."